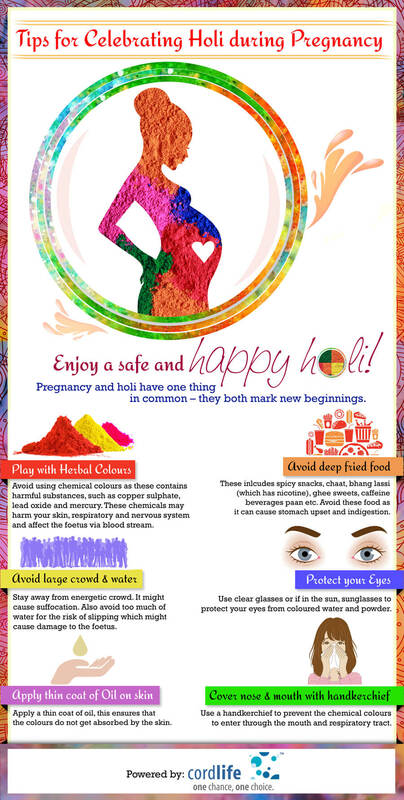 Enjoy a safe an happy holi! Avoid using chemical colours as these contains a harmful substances, such as copper sulphate, lead oxide and mercury. These chemicals may harm your skin, respiratory and nervous system and affect the foetus via blood stream. These inlcudes spicy snacks, chaat, bhang lassi (which has nicotine), ghee sweets, caffeine beverages paan etc. Avoid these food as it can cause stomach upset and indigestion. Stay away from energetic crowd. It might cause suffocation. Also avoid too much of water for the risk of slipping which might cause damage to the foetus. Use clear glasses or if in the sun, sunglasses to protect your eyes from coloured water and powder. Apply a thin coat of oil, this ensures that the colours do not get absorbed by the skin. Use a handkerchief to prevent the chemical colours to enter through the mouth and respiratory tract.